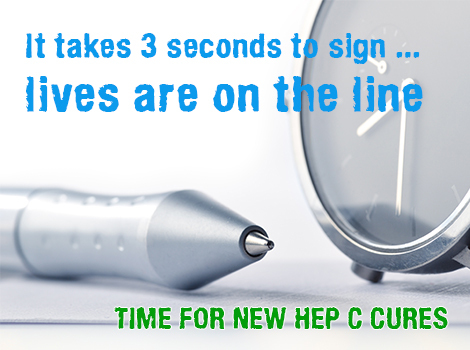 On World Hepatitis Day 2015, Hepatitis Australia officially launched the #TimeForAction campaign in an effort to increase focus on the need for all Australians living with chronic hepatitis C to have access to new generation medicines to treat and cure their infection. The campaign spanned many months using a variety of strategies and media. On 20 December 2015, the Health Minister, Hon. Sussan Ley announced that the new generation medicines for hepatitis C would become available to Australians via the Pharmaceutical Benefits Scheme (PBS) from 1 March 2016. The implementation of the #TimeForAction campaign was supported by the State and Territory hepatitis organisations and 27 organisations from around Australia came together to approach the Health Minister. Below is a collection of the materials and media releases utilised during the campaign. An open letter signed by 27 organisations was sent to the Health Minister calling for the new generation hepatitis C medicines to be approved for listing on the PBS. Click on the cover page below to read the full letter. Hepatitis C treatment webinar - What you need to know. On 30 July 2015 Hepatitis Australia conducted an interactive webinar to support the community in understanding more about the new generation medicines that could cure hepatitis C for most people. Prof. Greg Dore helped provide the information to clarify what new medicines were being considered, how effective they are and the process to have them approved on the PBS. Participants were able to submit questions during the webinar. You can access the webinar here. Please note the information provided was accurate at the time of broadcast. Information about accessing the new hepatitis C treatments. Once the new treatments were made available on the PBS it was important the provide the community and health professionals with information about access and use. from 1 March Hepatitis Australia released a treatments fact sheet (below) and a group of organisations released the Australian recommendations for the management of hepatitis C virus infection: a consensus statement 2016. The eCards shown above were used on Facebook and Twitter by community member to indicate their desire for the Health Minister to approve the listing of the new medicines for hepatitis C on the PBS. Click on the titles below to view the relevant media releases issued (in chronological order) by Hepatitis Australia. PBAC recommendations pave way for watershed year in hepatitis C fight. Tragic cost of delaying access to new cures revealed. New medicines ‘pay for themselves’ but too many Aussies denied access – new analysis. Never a better time to treat hepatitis C, but thousands still unaware. These stories in this book highlight that a desire to beat hepatitis C is a central theme and with understanding and support anything is possible. It is our belief that if we all work together, we can make a real difference to the health and well-being of people living with hepatitis C in Australia and create a much brighter future for everyone. You can download a copy by clicking on the cover below.